Click to see Tucker's 'great' views' concerning holocaust agnosticism! The past 12 months have been the best of years and the worst of years for Gilad Atzmon. I have written virtually no articles recently concerning someone who is now widely acknowledged as a holocaust denier and anti-Semitic. There is no need to rehearse the arguments as they are covered in my article A Guide to the Sayings of Gilad Atzmon. 2011 was, Atzmon believed, going to be a good year. His book ‘A Wandering Who’ was published in the Autumn and it carried blurbs from John Mersheimer and Richard Falk amongst others. However it quickly became clear that the theme of the book, namely that Zionism and its creation the State of Israel, were a product of a timeless Jewish identity stretching back 2000 years, was little more than an echo of Zionist propaganda. The question of Atzmon also began to cause serious disruption within the British Palestine Solidarity Campaign and its branches and the Zionists were quick to exploit any perceived support for him. At the same time, people began to be aware of an affair which had been rumbling beneath the surface. 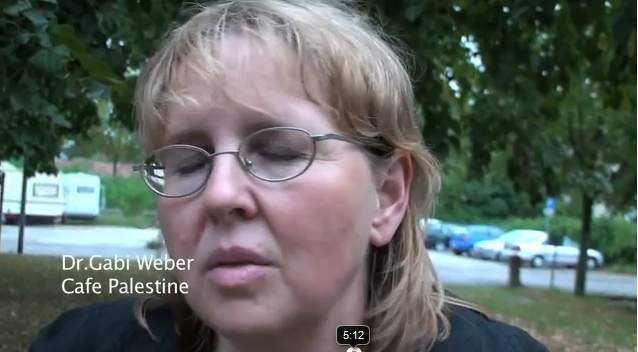 In Brighton PSC back in April 2011 Frances Clarke-Lowes, a former national Chair of PSC and Brighton PSC, came out as an open holocaust denier. He was quickly expelled by Brighton PSC and at the PSC AGM in January national PSC expelled him too. Despite the shrill protests of a handful of his supporters, FCL was expelled by an 80% majority, and most of the minority voted as they did because of either a belief in ‘free speech’ or else because they were members of a dotty Maoist group that sees North Korea as the only socialist state in the world. Three years ago a group of us had tried to ensure that PSC put a distance between itself and Deir Yassin Remembered, a group run by open holocaust deniers - Paul Eisen, Daniel McGowan and Israel Shamir. At that time all the unaffiliated members of its Executive, like Lea Tsemel and Michel Warshawski left. However the PSC Executive at the time didn't share our fears and we were heavily defeated. This time around the groundwork had been done and PSC Executive itself was in the forefront of ensuring that the movement was not associated with Atzmon and company. Its Aims and Objectives made it clear that holocaust denial and anti-Semitism was incompatible with membership of PSC. Atzmon found the removal of his holocaust denial friends from the wider Palestine solidarity movement hard to take and he set up his own ‘deLiberation’ site (presumably it is opposed national liberation). It is filled with articles such as ‘I’m So Glad We’ve Got Gilad’ by Francis Clark-Loweshttp://www.deliberation.info/im-so-glad-weve-got-gilad/. The Palestine mission in London also dissociated itself from Atzmon. This was followed up by the final nail in Atzmon’s coffin when Ali Abunimah, Omar Barghouti, the Angry Arab, Joseph Massad and others issued a joint statement Granting No Quarter: A Call for the Disavowal of the Racism andAntisemitism of Gilad Atzmon. The response of deLiberation was swift. An article ‘Ali Abunimah and Gilad Atzmon at the OK Corral’ by one Roger Tucker was published. Atzmon gushed that this was ‘Indeed a great article. It points at the differences between Abunimah and myself. Tucker is incredible and it is so great to see him on deLiberation…’ The article was also printed on Tucker’s One Democratic State site. 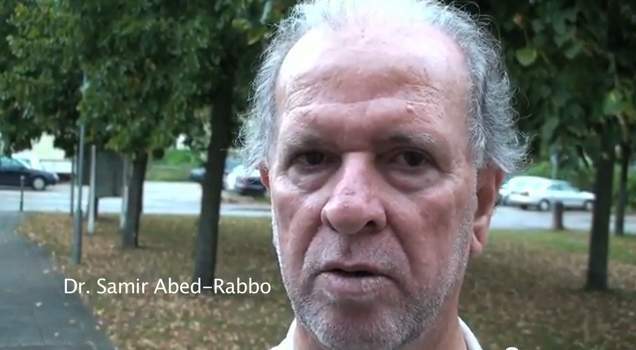 To those like Samir Abed-Rabbo, who accept Atzmon's denial that he is a holocaust denier at face value, despite all the evidence to the contrary, here is another example of those he works with. In 'The Holycause: Walking the Third Rail,' by Roger Tucker the subtitle is an alleged quote from Professor W. D. Rubinstein of Australia in September 1979: “If the Holocaust can be shown to be a myth, the strongest of all weapons in Israel's propaganda armory collapses.” W. D. Rubinstein, "The Left, the Right and the Jews," Quadrant (Australia), Sept 1979, p.27. The obvious implication is that if the holocaust can be ‘proved’ to have never happened, then bang goes Israel’s legitimacy. Out of curiosity I clicked the link and lo and behold I was taken to an article by one of the most prominent holocaust deniers, Mark Weber on the Institute of Historical Review site. The quote itself seems to be manufactured. I have Rubinstein’s book, admittedly not the Australian version, but it would be strange if the two editions were different. The date of publication is cited as 1979 whereas it was published in 1982. There is indeed a section on holocaust denial but the quote doesn’t appear, certainly not on the page given. There is a small section, pp. 87-89 on holocaust denial but Rubinstein, like the good Zionist he is, is more interesting in smearing the Left than challenging the far-Right. His concern is supporting Israel not opposing racism. But regardless if the quote is in the Australian edition then it is clearly an attempt to paraphrase the arguments and rationale of holocaust deniers. That is because Rubinstein gives 2 explanations for holocaust denial – Israel’s expulsion of the Palestinians in 1948 and a financial motive to do with repaying reparations to Germany. It isn’t, as Weber suggests, the view of Rubinstein himself but this is a good example of the dishonest methodology of the holocaust deniers. Six million Jews (more or less) died or were murdered - they don't specify - by the Nazis, mostly in the concentration camps. Most of those who died in the camps were gassed to death using Zyklon B (or diesel fuel, as some have claimed). These events occurred as the result of an official Nazi policy of extermination, commonly referred to as the Final Solution. Clearly Tucker is no agnostic as these are the same themes that all holocaust deniers espouse. In the past few days it has become clear that Atzmon’s supporters are trying to break out of the ghetto. A conference has been called, restricted to 50 activists only and from which the public is barred, in Munich by the One Democratic State group. 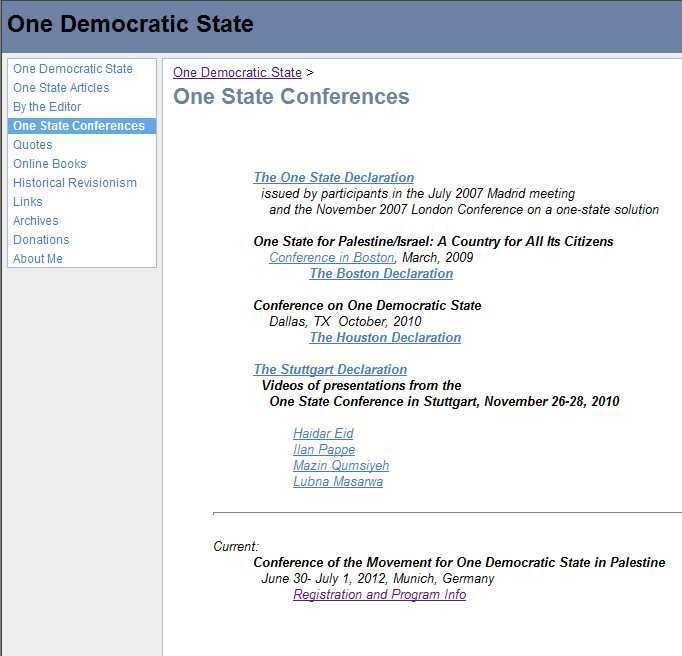 http://www.onedemocraticstate.org/pdf/Munich-Conference.pdf It is organised nominally by the One Democratic State in Palestine (Texas, USA) and the Palestine Committee in Munich, Germany but it appears that the real work behind the scenes is being done by Gabi Weber, who organised Atzmon’s Freiburg Conference last September. It features as a speaker Atzmon supporter Oren Ben Dor from Southampton University and is moderated by 2 right-wing business professors - Samir Abed-Rabbo from the USA and Makram Khouly from Britain. Although it also features speakers like Ghada Karmi and Mazin Qumsiyeh, it is clear that the Conference is an attempt to regroup by the Atzmonites in Germany of all places. Germany is, because of the holocaust unique. It has a political system where all major political parties support Israel. The Palestine Solidarity movement is weak there, and of course that is a consequence of the holocaust. To hold such a conference in Munich of all places smacks of a determination to ensure that support for Palestine in Germany remains confined to the margins. Below there is a short clip from the Stuttgart Conference that Atzmon gate-crashed a few years ago and the reaction of Ali Abunimah, who was in the chair. Today it would appear that Atzmon no longer has to gatecrash its conference. There is a lesson here. 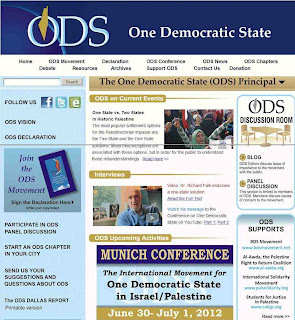 A legitimate organisation with lots of support, Deir Yassin Remembered, was taken over by a variety of conspiracy kookies, holocaust deniers and supporters of Israel Shamir. It cause people like Geoff Halper and many others to leave. In many ways that was where Atzmon came in. There is a clear and obvious danger that the One Democratic State group is likewise being taken over. If that is the case then it will consign itself to being irrelevant. One can only hope the lesson is learnt in time and that the Atzmonite cuckoos are removed. 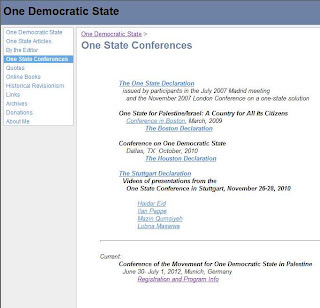 'ACJC Note:The Conference announced as a 'One Democratic State in Israel/Palestine' is not to be associated with the One State Solution movement that has sponsored previous international conferences. The common denominator of the organizers and the speakers is being soft on Atzmon, actively defending him, or being a total Atzmon nutcase like the main organizer, Gabi Weber. Other than the Texas organization, headed by Atzmon's friend, and the main site, which is of an organization that didn't exist before the conference, and looks like a front for Weber, all the sites that promote this are various shades of reactionary. This smells of rotten fish to high heaven. 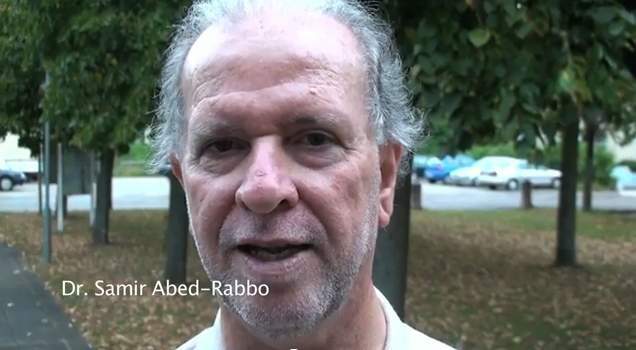 Samir Abed-Rabbo, who also seems to be one of the organisers and spoke at Atzmon's Freiburg Conference last year, despite asking for proof of Atzmon's holocaust denial seems unable to respond when presented with evidence. His only retort to the well substantiated allegations that Atzmon is an anti-Semite and holocaust denier is in the e-mail below. 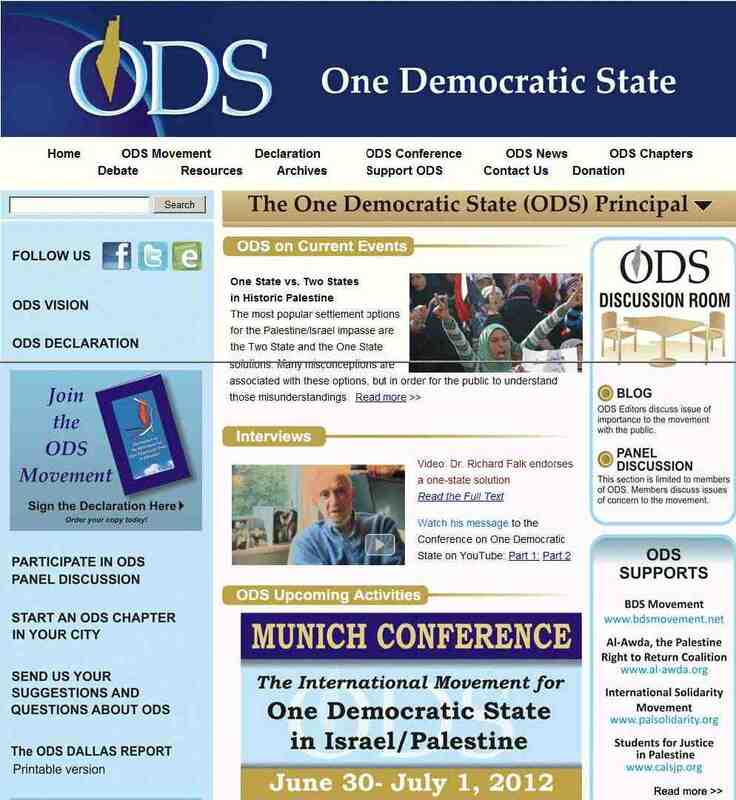 The ODS movement does not belong to you, me or any one in particular. We members of the ODS movement will not allow you or anyone else to tell us what to do, how to behave, what to believe in, how to express ourselves, and whom to associate with. We are committed and principled individuals who have been struggling for justice and peace for decades and we know our A, B. Cs when it comes to the Palestine Question. Our ideals are published and well documented. How dare you and others lecture and attack us and our movement and accuse us of being ant-Jewish or being hijacked by anti-Jewish individuals? You would have been right if you debate(d) the issues publicly with whom you disagree with and leave us and our movement out of your venomous attacks. But instead, you and your cohorts decided to subject us to Israel’s favorite practices: detention without due process and collective punishment. This simply will not work and I advise you not to waste our time and energy with these irrational attacks. We have better things to do! I know Dr. Weber and Mr. Atzmon and I spoke directly with them on the issues that you raise in your venomous attacks. I am convinced of their integrity and commitment to universal human rights. Both are not anti-Jewish and not holocaust deniers and are committed to universal human values including the right to freedom of expression- these values are obviously alien to you and your cohorts. In fact and simply put, I will not exchange the morals and ethics of one of them with those of a million of you! And that is it. Abuse aplenty from the professor but nothing of substance. Prof. Abed-Rabbo lists in his CV that he was 'Senior Trade Consultants, Amana International Trade Consultants, Brattleboro, VT, USA. Amana brokered business between American and Saudi companies. I left Amana to become the Dean of the Jerusalem School of Economics and Diplomacy.' As someone heavily involved in trade with Saudi Arabia and the Gulf emirates, it is clear that his politics reflect his business activities. what is the aim of this article, who cares about the yearly history of Atzmon. Just a personal message, since as a typical Zionist your business is lies and propaganda and I realize you wouldn't dream of publishing anything contrary to your dogma on your website. I'm just curious how it feels, as a left-wing defender of the faith, to be on the same team as the neoconservatives and the Christian Zionists. Defending the left flank of the ZioNazi juggernaut must be excruciating, the apogee of cognitive dissonance. Since I'm not a Zionist, let alone a 'typical one' all the rest of your argumentation falls away. There are about 900 blogs here. Find one arguing support for anything Zionist. Just one. Since I'm an atheist I defend no faith! I was arrested 6 years ago confronting Christian Zionists at a demonstration against the war in Lebanon. Not sure what the ZioNazi juggernaut is - but no doubt it is one of these things that live in the ether. So well done Roger. You are even more of a sad case than I imagined. You can't construct a simple sentence, let alone a paragraph that flows logically. You simply make a series of unfounded assertions and assumptions (eg. I know no neo-cons still less work with them). I put the inability to write these days down to schooling and deprivation. What's your excuse? A New Wave of Israeli Social Protests? Bin Laden – Had He Already Been Retired? First the Co-op – Next Tescos!